After two years of anticipating the new conference, the Bulldogs will finally drop the puck on their first season in the NCHC Friday night in Colorado Springs, Colo., against fellow WCHA departure Colorado College. Last weekend’s win and tie against Michigan Tech is probably what most fans expected out of the series, but the scores (2-1 and 1-1) likely weren’t. UMD’s offense may have struggled to generate crooked numbers on the board, but the defense and goaltending held strong, as did the penalty kill — all much-welcomed signs from a team with serious question marks in those categories entering the year. The Tigers pose a bigger offensive threat than Michigan Tech did, and the Olympic-sized sheet should help to fuel the firepower of both teams. How will the UMD defense play against a quicker team on a larger rink? 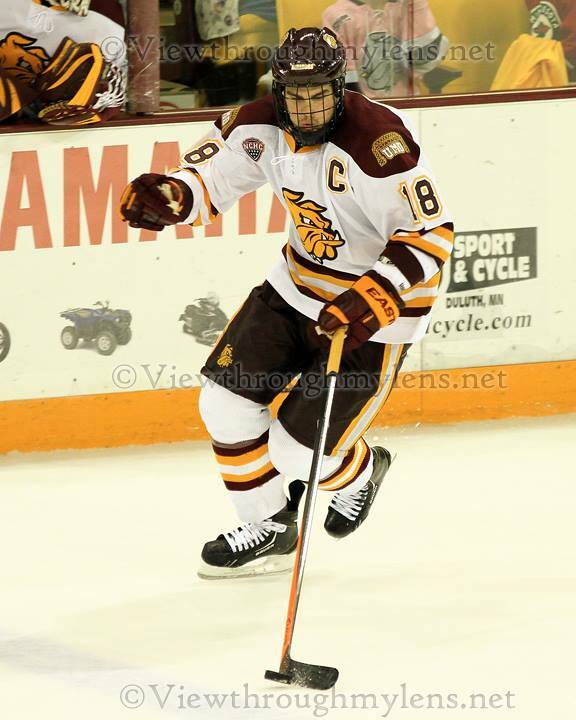 Will the Bulldog offensive attack and power play capitalize on their chances? Time will tell, but either way, this weekend series should be a good one. How to follow: Both games will be available live on 94.1 in the Twin Ports and 94xrocks.com around the globe. Also, Friday’s game is being broadcast on CBS Sports Network. Saturday’s contest can be viewed on CCTigers.com. Joe Basaraba will look to break his bad fortune against CC this weekend. had six shots to tie for the UMD lead last weekend — good things are bound to happen for the big, hard-shooting winger. Between the pipes, Matt McNeely was sharp last weekend, but is there a chance that Aaron Crandall gets the nod for a game this weekend? Neither has had success against CC (McNeely is 1-1 with a .868 saves percentage; Crandall is 0-1 with a 6.74 goals against), but the audition period to be “the guy” in arguably the toughest league in college hockey is just beginning and both netminders should elevate their games for the occasion. For Colorado College, youngsters Hunter Fejes, Charlie Taft and Gustav Olofsson should be watched each time they step on the ice. Fejes and Taft have the potential to be explosive offensive threats at this level, and Olofsson will be one of the best rookie defenders in the conference and nation. The Bulldogs will be focused on shutting down Alexander Krushelnyski, but not enough attention to the other three will spell trouble for UMD. By the numbers: The Bulldogs have enjoyed a good stretch of success against Colorado College lately, going 11-4-2 over the past 17 games between these two programs … UMD is 0-4-2 away from AMSOIL Arena since beating the Tigers in Colorado Springs last January … The Bulldogs have held opponents to a combined 1-for-22 on the power play since the end of the 2012-13 regular season … UMD is 29-0-4 over its last 33 games where it scores four or more goals … McNeely is unbeaten in six of his last seven starts (3-1-3) … Junior forward Caleb Herbert has five points (3-2=5) in four career outings against Colorado College, including a pair of power-play goals and a game-winning tally … One of Max Tardy‘s two career multi-point games came against CC when he recorded a pair of assists when the Tigers visited Duluth on Feb. 24, 2012.